If you are the one, who is looking for Jobs in the Srinagar City, then this post, has answers to all of your Questions. 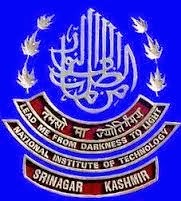 National Institute of Technology (NIT) Srinagar, had announced its Recruitment Project-2015 and invited application for various posts. The applications are invited for Office Assistant and Accountant posts. These Posts are contractual and contract may or may not be extended. This NIT Srinagar Recruitment is the First Recruitment Notification of 2015 and it was published on 21st April, 2015. The Recruitment Notification is published in the Local Dailies of J&K Like Exceslior, Rising Kashmir etc. Applicants who are willing to apply for any of these posts, must submit their applications before Last Date ie 30th April, 2015. In this post, we are going to share the Complete Details of Jobs advertised by NIT Srinagar. If you are looking for a reputed Government Job in J&K, then we have a very good news for you. This Government Job is notified Once in a Decade, so all we can say that it is a Lifetime Opportunity to grab this golden chance. "Naib Tehsildar Jobs in J&K's Revenue Department"
This Current Naib Tehsildar Recruitment in Revenue Department is being done for 134 Posts. Naib Tehsildar Exam is a highly competitive exam, even more competitive than the KAS Exam. The Last Naib Tehsildar Exam was held in Feb, 2009, in which over 50,000 applications were received for 111 Posts. Now, with High Un-employment Levels and growing no. of College Pass-outs every year, it is expected that More than 80,000 People will apply for 134 Posts. So, start preparing for this Exam at the earliest, to give yourself the advantage to get some more preparation time. We can say that, Its raining Jobs in J&K, since the formation of New Government .Its looks that Mr CM (Shri Mufti Md. Sayeed Ji) is fulfilling his promise to eradicate the Unemployment from the roots of J&K by announcing Jobs after Jobs since he gets on to the Chair. Today, Directorate of Family Welfare, Government of J&K had issued a Recruitment Notification and invited applications for Class IVth posts in 17 Districts of the state. The Recruitment will be done, at district Level and applicants can apply only for the posts advertised for their respective district only. In this post, we are going to share the complete Vacancy details for Class IVth posts in Department of Family welfare J&K. Applicants willing to apply for these jobs, must read this post till end. The Notification regarding the Jobs in Ellaquai Dehati Bank (EDB) is released online at the EDB's Official Website and the same will be published in the Local Newspapers of J&K in coming Days. The Online Registration will start from 10th April and you have got 14 Days time (ie 24th April) to submit your application form online. In this post, we are going to share each and every Details, you need to know to apply for Jobs in Ellaquai Dehati Bank. Applicants are advised to read this post till end and apply online, only, if you meet the prescribed eligibility criteria. It is after a very long time, that J&K High Court had announced Jobs for Graduate. So, if you are a Graduate, then this is the best chance to go and grab the Govt. Job in J&K's Highest Judicial Office. If you are a Bank Job Seeker and looking for Bank Jobs in your Hometown (J&K), then there is a very good news for you, as J&K Bank, the biggest employer of Manpower in J&K had announced a huge vacancy for Relationship Executive Post. With over 800 Business Units (Branches), this Private Bank is the Backbone of J&K's Economy and dream destination for many. Relationship Executive (RE) Post in a J&K Bank is a dream job for many, as you need to serve with in your Homestate along with good salary and perks.This is not the First time that J&K Bank is conducting the exam for Relationship Executive post. Last Time, the RE Exam was held in Nov, 2012. This is the 3rd Time in Last 8 years that J&K had invited applications for Relationship Executive post.